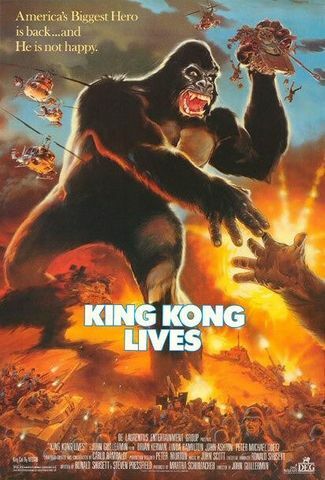 King Kong Lives movie poster. King Kong has been kept alive on life support by surgeon Amy Franklin since his plunge from the World Trade Center. He is in drastic need of a blood transfusion, but only another giant ape can provide the amount, and type, of blood Kong needs. Adventurer Hank Mitchell discovers a female giant ape in Borneo, though, and the surgery is a success. However Kong and his new mate escape to wreak havoc. Stock footage from the 1976 movie is used to recap Kong's supposed death atop the World Trade Center in the first film. Later, several Iroquois are used by Colonel Nevitt's forces to spray Kong and his mate ("Lady Kong") with knockout gas. The one on the left is a UH-1B model, notice the vent grill by the engine. Southern Air Transport cargo plane used by Hank Mitchell to arrive in Atlanta with Lady Kong. Registration N251SF, c/n 382-4590. It's the civilian version (L-100) of the C-130. Reg. N251SF Lockheed L-100-30 Hercules of Southern Air Transport. Used by Nevitt's men to airlift the comatose Lady Kong from the battlefield. Registration N191CH, Boeing Vertol CH-46 built in 1962 (c/n 2003). Hank returns from a trip to Borneo in this passenger jet. Boeing 737-201 Advanced of Piedmont Airlines. Hank and Amy search for Kong in this plane. Fake registration N63636. This page was last modified on 18 January 2019, at 11:42.